South Carolina Archives and History: Campbell’s Covered Bridge, built in 1909, is significant for its role in transportation in early twentieth century Greenville County and as an excellent intact example of a Howe truss covered bridge, the only surviving covered bridge in the state. Charles Irwin Willis, an accomplished local builder in the northern part of Greenville County, built the bridge. The bridge was named for Alexander Lafayette Campbell, local landowner and millwright who lived at the site and operated a corn grist mill about 50 feet downstream from the bridge. 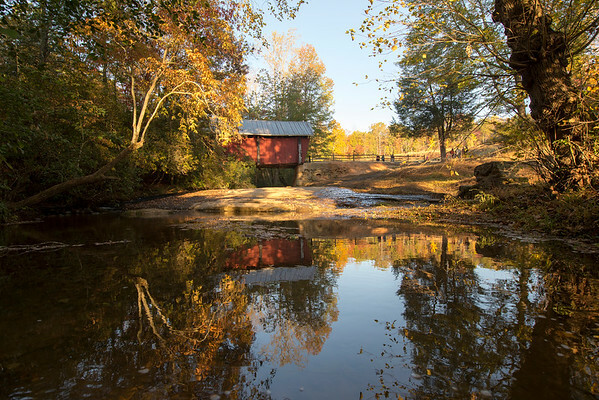 The bridge was one of four covered bridges built in this part of northern Greenville County in the first decade of the twentieth century. Campbell’s Covered Bridge was the largest and most sophisticated of the four. The construction of this bridge connected several rural communities and small towns in the immediate vicinity, so that a 25-mile trip which had once taken a full day before the bridge was completed could be made in about an hour afterwards. Campbell’s Covered Bridge is a four-span Howe truss bridge with counter braces. The two outer spans are 9’ long and the two inner spans are 8’ long. Each truss is 4” x 8”, and each counter brace is made from 2” x 8” pine boards nailed together in an interlocking pattern. Vertical tie rods called kingposts, made from 1” diameter iron rods, are in between each span, tying the top and bottom chords together. This method of truss construction absorbs and transfers a passing vehicle’s weight to the rock abutments on each end of the bridge. The bridge is 35’ long by 12’ wide and has a metal roof. Listed in the National Register July 1, 2009.